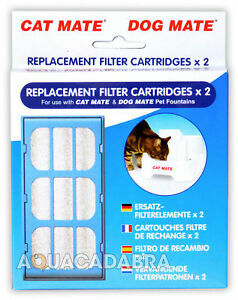 These Pet Mate Cat and Dog Replacement Filters are suitable for use with Catmate and Dogmate drinking fountains and will ensure a beloved pet's drinking water remains hygienic and clean. The pack contains two filters and weighs 70g, allowing for easy filter changes whenever necessary. They operate on a polycarbonate system which allows for high quality filtration and purer drinking water for dogs and cats. Immediate payment of GBP 6.50 is required.